With the election of an black president, people heralded the dawn of a new post-racial era in American politics — one in which skin color didn’t bar you from holding the highest public office in the land. But in 2014, who actually wields political power, from the county up to the national level, to make decisions that impact you every day? Congress is still all white men. Overwhelmingly so. According to a new study of 42,000 elected officials released Wednesday by the Women Donors Network, white men hold 65 percent of elected offices in the United States, even though they make up only 31 percent of the total population. In turn, women only hold 29 percent of public offices but make up 51 percent of Americans. The gender gap in this study too is striking – the authors estimate that men have three times more political power than women – and it's certainly unacceptable. But even more so than gender, race still closely tracks who sits at the table when important public decisions are made in courthouses, state houses and Congress. 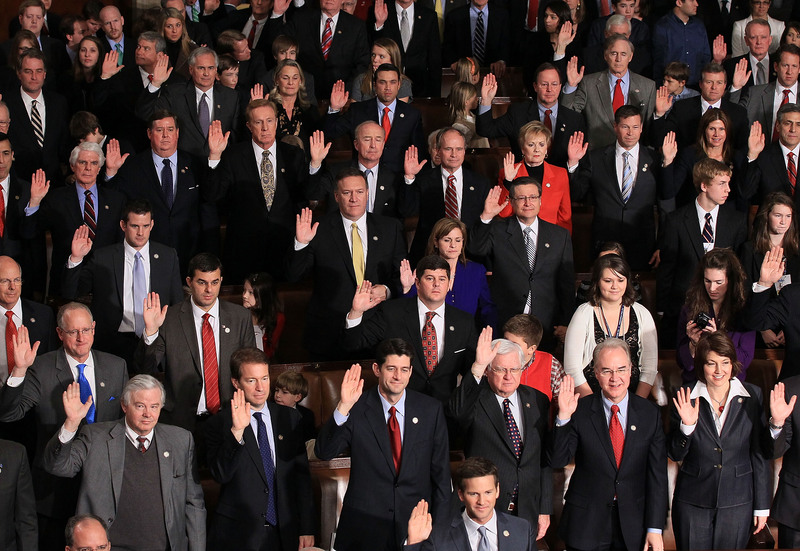 A whopping 90 percent of elected officials are white. More than one-third of Americans today are people of color, yet nearly all of their elected representatives are white. In the quarter century since the Voting Rights Act was passed to protect minority access to the ballot box, only one out of every ten officials is of color. For women of color, the statistics are even worse. They make up just four percent of elected officials, leading the study authors to conclude that white men possessed eight times the political clout. To illustrate how absurd this is: Just under 18 percent of the 113th Congress are people of color. In turn, nearly 40 percent of congressional members listed the law as their occupation in a Congressional Research Survey. These gaping power imbalances help explain why our government, at the local, state and national levels, pays little to no attention to the serious issues and obstacles facing communities of color. Economic neglect and disadvantage; racial injustices in criminal justice, law enforcement, housing and voter access; health care access for marginalized communities; worker protections; educational opportunities – all of these issues are pressing needs for many communities of color, yet they too often get shunted to the side. This problem of political representation is hurting women too. Across the board, white men are making decisions for women of all races about their sexual health, their workplace protections and their children’s education, among other issues, often times with little input or perspective. If more than 21 percent of Texas state legislators were women, we might not be facing such harsh attacks on women’s reproductive health. This study reveals the true barriers to equal political participation in America today aren’t a matter of law, but of access. Women and people of color tend to have less access to resources, to networks and to the current establishment, which come at a premium when a candidate wants to run for public office in today’s world of uncontrolled campaign donations. If we truly want to see our Congress, legislative assemblies, state courts and county commissions reflect the diversity of our communities, then we need to get the financiers and corporate donors out of politics and proactively provide resources and support to minority candidates.